It happens usually in mid August. There will be an evening when the air carries a little extra chill and suddenly you become aware that autumn is waiting in the wings of the day, just beyond your perception. It is the gentlest of whispers, carried on the breeze that signals summer is in decline and we are actually slipping slowly and quietly into autumn. My cats usually pick up on this subtle change in the air too and they have already staked out their favourite places to sleep in various parts of the house, their summer wanderlust exhausted. Perhaps it’s our Celtic DNA but I have no doubt that the old Irish calendar is right and we are now in Mean Fomhair – the middle of autumn. The leaves have yet to turn and the weather is still mild but summer is over. We have arrived at the evening of the year. September is a particularly delicious month. After the slack routines and exertions of summer, order is restored as the children return to their studies. The new academic year offers us all a chance for a new beginning. Another chance to make the changes to our lives or lifestyles we may have pondered as we lay soaking up the rays of summer sunshine. September is a hopeful month and yet a month that makes no demands of us with no festivals or bank holidays. It is not surprising that in a recent survey in the UK less than one percent of those surveyed nominated September as the most stressful month of the year. The most stressful honour went, unsurprisingly to January, followed closely by December. But what makes September particularly worth savouring is that it is a month which signals a slowing down. Autumn is when Mother Nature draws her energy inward, as the leaves fall and the earth prepares for the long winter sleep. Me, I make preparations for the long winter nights. September makes me look again at my living space to see how I might make it cosy and warm. All it might take is a new throw for the sofa and a load of wood logs in the basket ready for the first fire. By the end of the month I will have made the excursion under my bed to retrieve the storage boxes that hold my winter hoodies and fleeces, clothes that only require any old body as opposed to a supposedly ‘beach ready body’ we need for summer wear. Which is just as well as September is all about my kind of food. In preparation for the frugal winter, nature is giving up her harvest. Orchards are full of fallen apples and anyone can savour the rich bounty of the hedgerows which are now bursting with berries. It is the month for apple and blackberry crumble and time to replace cream with warm custard. It is the month when menus change – domestic ones anyway, with the welcome reintroduction of warming food like shepherd’s pie, bangers and mash and big pots of spicy vegetable soup. Slowing down and comfort food, what more could you want? But there is more. September is also the most sensual of months. The air smells different carrying perhaps a hint of wood smoke or bonfire. The light softens, lending a warm glow to the landscape as the sun moves away from us. The countryside and parks are a riot of autumnal colour in hues of russet and gold and red and orange. It is a month to get out and walk, savouring the smells, the colours and the sound of leaves crunching underfoot. And a chance to visit your inner child by reliving the thrill of finding and collecting pocketfuls of wine-red shiny chestnuts. September is like climbing into your own freshly made bed after a wonderful, busy, fun holiday. It is like coming home after a hard day’s work to a warm welcoming house, closing your front door and knowing you won’t have to venture out into the world again till tomorrow. It’s like putting on your comfiest slippers after a day in fabulous but rather painful shoes. It’s the feeling that all is well with the world that sometimes comes with the first sip of red wine. September is all about just being rather than doing. Maybe in a former life I was a bear. Perhaps that is why I love this month so much. But I am ready to waddle, book in one hand, hot chocolate in the other, into my fireside where I will park myself on a comfy chair, put a soft blanket over my legs and a cat on my lap and I will while away many happy evenings. And best of all about September? It precedes October. Oh how I love October. Sometimes being a feminist is kind of confusing. It is very easy to become hyper aware of anything that could be viewed as being degrading to us women. And if you look hard enough you will find such things everywhere. But it is vital that before we decry the culprit that we take a wee moment to think. I know that I don’t want to live in a world where we are ultra politically correct all the time at the expense of our ability to laugh at ourselves – individually or collectively. Therefore when your senses are assaulted by an image which shouts ‘foul’ or ‘this is sexist’ as a friend of mine says ‘judge a pause’. Three such images appeared in the media this week. As first glance all three looked sexist but in actual fact only one was.... in my humble anyway. First up was the full page ad that Today FM took out to announce two new male presenters of their lunchtime show. The ad featured a bra with the male presenters featuring in each cup and there was a tag line of Double D a play on the image and the fact that the presenters are called Dermot and Dave. Next one that crossed my consciousness was the image used in a campaign that has just been launched by Concern and Women’s Aid called ‘Are You Man Enough To Walk In Her Shoes’ There was a cartoon image of a male figure in a pair of high stilettos. I guess is asking men to try to imagine what it feels like to be a woman – and a vulnerable one at that. The last image of the week appeared in the Irish Times yesterday. It was a PR shot to announce the Cancer Society’s Paint It Pink campaign. It featured RTE presenter Keelin Shanley (a breast cancer survivor) dressed in pink holding a tin of paint and a very attractive bare chested young man up a ladder supposedly painting the door. As someone who worked in PR and the partner of a professional photographer it was most definitely a cracking photo which drew the eye in immediately. The image was also used in The Journal and can be seen here. So your honour, which of these images is guilty of being sexist? Only the first one. Why? Like most other things in life, because of the context. 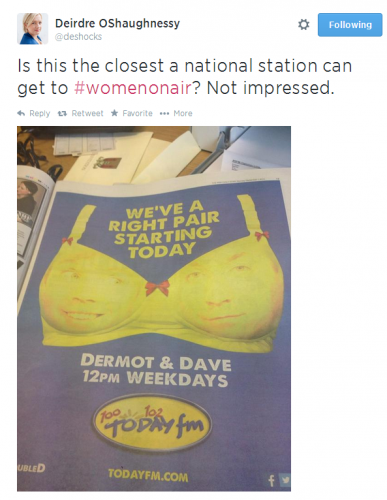 This ad featuring male presenters’ faces on a bra is sexist because it was put out by a radio station that has not one female presenter presenting a daytime show during the week. It is boys radio and so therefore cannot use women’s breasts to advertise a programme not matter how clever the play on words. If the station doesn’t think that women should present primetime radio shows, then they can leave our underwear out of their campaigns. So Foul and Sexist can be correctly labelled to this ill conceived campaign. The second campaign ‘Are You Man Enough To Walk In Her Shoes’ I don’t have a problem with even though I don’t own and never had owned a pair of high shoes. But I know that makes me the exception rather than the rule where women are concerned. Most women I know own and wear high heels – not every day maybe but regularly. Therefore it’s fair enough to use this fact to come up with a fun campaign to raise money for vulnerable women. And high heels do make women vulnerable... but that’s a different column. Lastly, the PR photo for cancer that featured Keelin Shanley and male model Darragh Hayes was simply a great photo. Mr Hayes is a model doing what he does best – looking delicious. Irish (female) models regularly post in bikinis to promote all range of weird and wonderful products. Yes I agree it’s a lazy photocall but I believe if we even up the score a bit – more handsome chaps looking.. handsome I can live with it. I am not sure I want to live in a world where being able to admire a beautiful body is outlawed in case it offends someone. As long as it is models that are used and the score is even – as many men as women – so what? As we become more aware of women being undermined and belittled we are in danger of over reacting. We need to bear that in mind, sisters!